Did you know you can learn more about filing tax returns (and even complete your own!) AND give back to the Austin community? ACC 366P/384 Accounting Practicum is a Spring 2019 course that ANY BUSINESS MAJOR can sign up for! 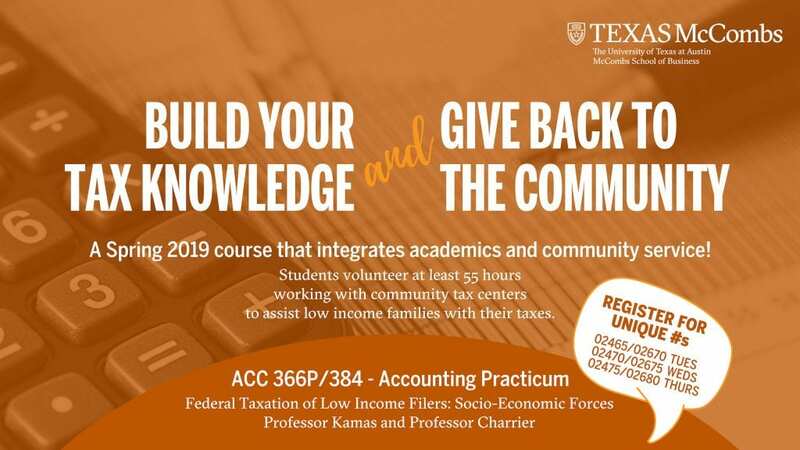 Professor Kamas and Professor Charrier train and certify students to prepare personal tax returns for low income filers in partnership with Foundation Communities, a local nonprofit that offers affordable homes and free on-site support services for thousands of people across the city of Austin. Last year Foundation Communities helped over 20,000 households and returned almost $35 million in tax refunds and credits in the Austin area. The University of Texas at Austin students accounted for prepping over 1/3 of those refunds! The volunteer hours are flexible with different locations around Austin to volunteer. It’s an amazing way to give back! Open to ALL business majors!